Plus Manufacturer To Dealer Freight Charge of $2,000!! When you need time away from home to relax and unwind, then come choose this single slide out Zinger ZR285RL travel trailer by CrossRoads RV. This model also features a rear living area and a front bedroom. Within the slide out there is a 41" x 77" u-dinette where you can enjoy your meals or you can convert this area into additional sleeping space, there are also two recliners which are across from the entertainment center. With two entry doors you can easily slip out in the early morning to go on a fishing trip or a quiet walk. Get ready for plenty of camping excursions with your family when you choose to camp with a CrossRoads RV Zinger travel trailer! These models feature tinted windows which help to create more privacy. There is also an aerodynamic front and nitrogen filled radial tires. The totally enclosed and heated underbelly with forced heat allows you to camp in cooler weather! Inside each model you will find premium residential furniture as well as Maple cabinet doors and drawers. The kitchen backsplash adds just the right touch of elegance, plus there is a stainless steel high rise faucet, oven, and microwave! Let a Zinger travel trailer be your home away from home! Why buy family??? When you buy from a family owned operation you are becoming part of that family, you are not buying a CEO another million dollar home on some exotic island. What you are doing is helping the families of everyone involved with the operation buy there kids uniforms, help their mothers put food on the table and helping their fathers provide a roof. 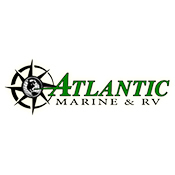 We would love to be that family you chose to do business with but if we don't have the right item for you please give our local family owned guys a call.Atlantic Marine and RV, you one stop recreation dealer, boasting over 100 RVs and boats especially sourced to fulfill your recreational needs.. Although, Atlantic has a vast inventory, we are a small family owned business. The first name you will need to know when coming in to view inventory is Jacob Frasier, he is a travel trailer expert and a local Floridian that has been fishing the intercostal waters since he was a kid. The second name you will need is James Byrnes a master tech that will be taking care of all your service needs, insuring your unit is repaired properly. Amanda Britton will be your go to source on all scheduling matters; rentals ,service appts, drop offs, pick ups, and general parts and service questions. Atlantic has a no pressure sales lot, with the Florida New Price Guarantee no one can beat our savings, were confident that you are getting the best price and the best service out there and if you find one better we will beat it. If you want to shop a large selection of recreational vehicles including boats, RV's, travel trailers. campers, motorcycles etc without the high pressure sales, please give us the opportunity teach you about the recreational life style and provide you with an education on the right unit for you, Ultimately we would love to see you experience life your way and in the vehicle that fits it, at Atlantic Marine and RV in Ft. Pierce Florida.